Kyra, how did you come up with the title for your book? Does it have any special meaning? The title refers to an ancient book that’s at the heart of the story, which contains the key to solving the mysteries surrounding the origins of magic – as well as something completely unexpected! I love Perarre, but Professor Roric Rossony is one of my all-time favorite characters. Crusty and unpleasant on the outside, soft and sweet on the inside. He’s a complicated, multi-dimensional character, and even in the later stages of revision I was still learning new things about him. The importance of freedom of thought and learning, and the healing, redemptive power of love. The romance between the main characters and the fantasy storyline are both essential to the story; if you took away either one, there wouldn’t be a book. “The author has done a stellar job at painting for us who Perarre and Roric really are: how they live, their fears and aspirations, the parts of themselves they’re ashamed of, and their courage.” – Antonio Simon, Jr. 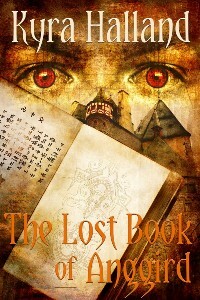 Thank you so much for featuring The Lost Book of Anggird today! Thank you 🙂 I’m pretty proud of it. Next Next post: Blogs Vs. Newsletters: What’s the Diff?